No matter how fast you think your computer is, time will eventually bring it down to the slow crawl of a hill-climbing Datsun. At least you may be able to speed up your typing, thanks to Matias’s Dvorak Keyboard. Yes, now Mac users can join the revolution with their own hardware Dvorak keyboard. If you’re not familiar with the Dvorak keyboard—no relation to either the noted tech pundit or the Czech composer—it’s a specially designed keyboard layout that supposedly provides faster typing speeds than the standard QWERTY design. Of course, Mac users have been able to switch to a Dvorak layout via software for years, but if you’re just learning the layout or you’re the hunt-and-peck sort, the hardware keyboard has its benefits. The Dvorak layout, designed by the late University of Washington Professor August Dvorak, aims to decrease typing fatigue and increase the number of words that can be typed per minute—in fact, the recorded peak speed is an astounding 212 wpm. The keyboard can also quickly switch back to the standard QWERTY format, for those occasional circumstances that might call for it—for example, when you’re trying to log in to your computer, or when your non-Dvorak savvy friends want to borrow your computer (and you’re tired of giggling at them). The design also includes an improved resistance that can support the weight of the human hand, helping reduce fatigue, and also includes a two-port USB hub. 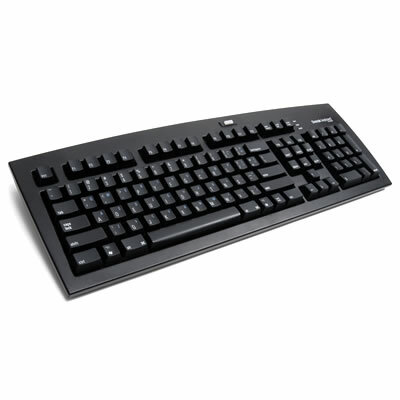 The keyboard retails for $100 and can be purchased at Matias’s Website or at selected retail stores.